This extremely special wine tour of Northern Spain takes in some of Spain’s best wine regions, including Ribera del Duero, Navarra, and La Rioja. You will also see the beautiful Basque Country and pristine Pays Basque in France. Taste delicious wines at high-end cellars, dine at the top gourmet restaurants in Spain and visit some of Spain’s most charming medieval and coastal villages. Your wine tour begins when your charming, private driver guide meets you at Bilbao airport, and you will first head south to the Ribera del Duero wine country. Stay in a converted monastery that now houses a 5-star hotel with spa, visit top wine cellars like Pesquera and Finca Villacreces and enjoy architectural marvels like the crusader castle of Peñafiel and the stunning, Gothic cathedral of Burgos. In La Rioja next, your base for this leg of the tour is Laguardia, a delightful, medieval town located at the top of a hill, overlooking vineyards and surrounded by an ancient wall. After a few fascinating winery visits to leading Rioja estates like Marques de Murrieta, Roda, and Remirez de Ganuza over the next few days, you will continue on to Navarra. 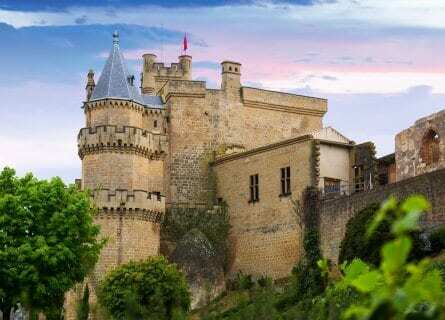 You will visit a prestigious leading wine estate before carrying on to Olite, a lovely historic village founded by the Romans, and later used as a Royal residence for the Kings of Navarre. There is an absolutely stunning fairytale castle here that you will be able to visit, climbing up the ramparts and towers. You will drive north next, to Spain’s beautiful, rugged Atlantic coast. 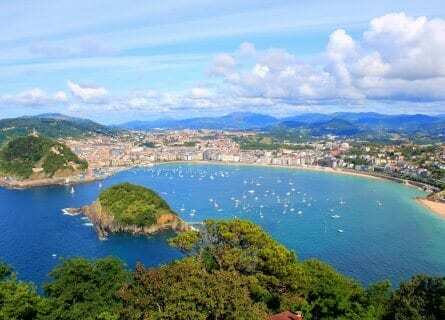 Conclude your tour of Spain with a few days in the stunning Basque Country including a Michelin starred lunch in the fishing port of Getaria, a visit to Frank Gehry’s groundbreaking Guggenheim Museum in Bilbao, picturesque St Jean de Luz and of course the gourmet epicenter of Spain- San Sebastian. If you are a food and wine lover and prefer to relax and explore small, charming villages to big hectic cities on your vacations, then you will enjoy this trip immensely! Unwind and let your personal chauffeur drive you so you can enjoy the wine tasting! Contact us for more information on this unforgettable luxury tour of Northern Spain. This morning you will arrive at Bilbao airport where your own private driver guide will be waiting for you. Travel south by comfortable Mercedes to the historic town of Burgos. This ancient city was founded in 884 AD but came to major prominence when it was the capital of the united kingdoms of Castile and León in the 11th century. In the 13th century, the gothic cathedral was built, one of the most spectacular cathedrals in the world! 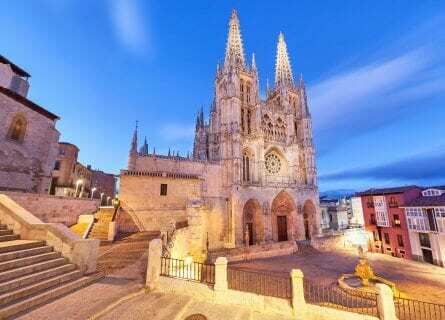 You will enjoy a visit to Burgos including its stunning cathedral (where Spanish folk hero El Cid is buried). With your driver guide, enter the old town via the fairy tale “Arcos de Santa María” gateway (complete with turrets) and spend the morning exploring. You will see the “Casa del Cordón”, a 15th-century palace where King Ferdinand and Queen Isabella welcomed Columbus after his 2nd voyage to the Americas in 1497. A wonderful traditional Spanish lunch will be organized for you in an atmospheric winemaker’s “Mesón” Try “Alubias rojas de Ibeas” (red beans), Bacalao gratinado con pimientos secos (cod gratin with peppers) and the mythical local roast lamb (slow cooked in historic wood ovens). After lunch, head to your luxury spa hotel, located in a converted monastery. But first, enjoy a stop in the pretty town of Lerma for a coffee/vino and a short stroll. We suggest the beautiful Parador palace right in the Plaza Mayor, an atmospheric spot to enjoy a glass of wine. Early evening arrival to your hotel and some free time to enjoy a relaxing spa circuit. Today you will spend the day discovering the wines of Ribera del Duero. You will visit two leading estates and visit one of the region’s most preserved castles. Learn all about the Tempranillo grape variety (called “Tinta Fina” here). Begin with a short drive to the first cellar such as Pesquera! After a private tour, enjoy a guided tasting of fine wines from their various estates including Pesquera, Condado de Haza, Dehesa la Granja, and El Vinculo. Follow with another terrific tour at the beautiful Finca Villacreces estate where you will taste an array of wines from their group such as Izadi, Vetus and of course estate wines from the Finca. The wine tasting will be accompanied by gourmet goodies like Queso Flor de Esgueva, Chorizo Ibérico de Guijuelo, and Aceite Único de Hacienda Iber. After a morning of wine tasting and strolling through the vines, you will be well ready for some lunch. We will have a special lunch organized for you at a convivial little eatery in a converted ancient mill on the river. This restaurant is revered for its stylish reinterpretations of classics, like suckling roast pig with baked apples, duck foie jazzed up with mango chutney and comforting chocolate and caramel soufflé- paired with local Ribera del Duero wines from estates like Mauro, Aalto. After lunch, you will visit the medieval hamlet of Peñafiel and enjoy a drive up to the Crusader castle to take in the views over the vast arid plains of the Ribera, take some photos or perhaps peek into the provincial wine museum. Then settle back into your luxury spa resort and enjoy the facilities and terrific onsite dining. Today you will head north into the sublime Rioja wine country. Arrive at Haro, the main wine hub in the Rioja Alta appellation (Rioja is subdivided into 3 regions- Rioja Alta, Rioja Alavesa, and Rioja Baja). 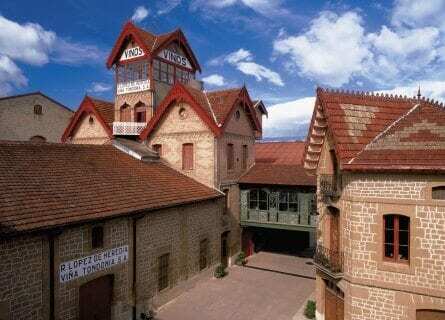 Haro is where the majority of the 19th century “Chateaux” are and you will begin with a visit to one of the most beautiful and classic estates like López de Heredia. Founded in 1877, the cellar is supremely romantic. You will have a private tour of the facilities and conclude with a tasting in the futuristic Zaha Hadid designed wine shop. Taste their main wines like Viña Tondonia Reserva and the unique Viña Gravonia white. Your second wine tour this morning contrasts with the first, at Bodegas Roda. Roda is quite possibly our favorite winery in Rioja, making modern style wines with less oak and more fruit forward. You will tour their stylish cellar and see the beautiful barrel cellars, before enjoying a private tasting of all their wines- Roda I, Roda II and Cirsion. At this estate, you can also taste their olive oils, made in Catalonia (the owners are Catalans, not local Riojanos). Lunch is next in a pretty converted monastery. Traditional fare is served with innovative presentation and the restaurant is overseen by a Michelin starred chef. You will have a top-tier Rioja wine at lunch today like Torre, Muga or Artadi’s Viña El Pisón. After lunch, transfer to Laguardia, your base for your stay in Rioja. Check into your adorable little inn, right in the heart of the pedestrianized, medieval hamlet and the rest of the late afternoon is yours to explore this walled village. Don’t miss the two outstanding churches (Iglesia de San Juan Bautista and Iglesia de Santa Maria de Los Reyes), they are gorgeous! Take a walk along the Paseo del Collado, following the ancient wall, and admire the views below in the surrounding valley. This morning you will begin with a peek at the beautiful Ysios winery, designed by Santiago Calatrava. Have a look at the vineyards and bring the camera as there is a great view of Laguardia from here. Carry on to the medieval, darling hamlet of Samaniego where cult collector estate Remirez de Ganuza is located. Like Roda, it is one of the modern style Riojas and their Trasnocho wine is the belle of the ball in the wine press. Begin the tour with a few minutes in the vineyards and then a private tour and tasting are next, enjoy! Carry on to the outstanding Torre de Oña estate, this idyllic bodega is a sister winery to the renowned Rioja Alta and apart from their sensational wines, it is utterly beautiful. Your tour will include a wander through the immaculate vineyards and stunning cellar, ending in their delightful dining room for a tasting lunch of tapas and their highly acclaimed wines. After lunch drive to the Marques de Riscal winery to see the impressive hotel designed by Frank Gehry and enjoy a coffee or digestif at the bar. The rest of the afternoon and evening is yours, with your driver available if you’d like to go sightseeing. From Rioja, today you will travel to Navarre (Navarra, in Spanish). This wealthy, mainly agricultural region is pristine and largely unspoiled. 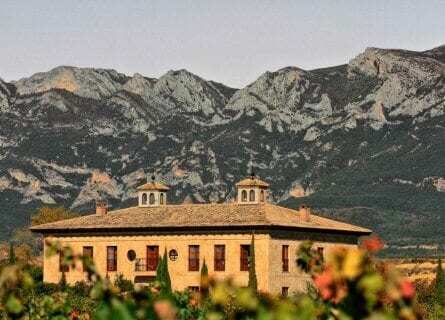 You will visit one of the most famous wineries in the appellation like Castillo de Monjardin. Located on the Camino de Santiago (St James pilgrimage way). This alluring estate houses a castle and vineyards planted with Chardonnay, Merlot, Pinot Noir and of course Tempranillo. Taste a range of wines and take in a very pleasant tour. Next up is lunch and another great tour and tasting at Señorío de Arínzano, a chateau concept (Pago) estate with and a cutting-edge bodega designed by Spanish architect Rafael Moneo and a beautiful property where vineyards have been planted since the 11th century. This is VIP and a very enjoyable visit. Their oak-aged Chardonnay is delicious! After lunch, one of Spain’s most picture-perfect castles is next in medieval Olite. Fairly off the beaten tourist track, Olite is extremely cute and also one of the major centers of wine production in Navarra (Ochoa is here, for one) and you can pop into the small little wine museum. Enjoy the walk up to the castle on the narrow, cobblestoned streets. Your driver guide will walk you to the 13th-century castle which you can then discover on your own. You can climb turrets and cruise the ramparts, you might very well feel like “Rapunzel”! Bring the camera today. Then it is just over an hour back to Laguardia. There are a multitude of wine bars, bistros and recommended restaurants just steps from your hotel. You will take a break from wine tasting today and focus on great food and some coastal sightseeing. From Laguardia, you will travel to Pamplona (catapulted to world fame when Ernest Hemingway wrote about the Running of the Bulls, which takes place here). With a private guide, you will visit Pamplona’s most interesting sites like the 18th-century Cathedral, the Capilla de San Fermin (patron saint of the town whom the running of the bulls is dedicated), and various gardens. Have an aperitif in the pretty Plaza del Castillo before driving to the Atlantic coast to lovely Hondarribia. 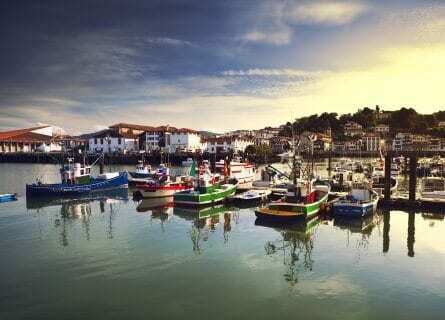 Hondarribia is just next to the French border and is one of the sweetest villages in Spain with a very appealing old town overlooking the River Bidasoa and protected from invading French forces in the past by its 15th-century walls. Go for a wander and take in the lovely views. Lunch then is a treat at a Michelin starred Basque restaurant in the fishing port of Getaria, Elkano, specialized in ultra-fresh seafood (most of which is grilled outside). This is a highlight! After lunch, visit this beautiful little port town on your own or with your driver guide. See the sinking church, the colorful boats and follow in the footsteps of Juan Sebastián Elcano, the Spanish explorer from here who completed the first circumnavigation of the world (on the Magellan expedition). If you like fashion, there is a museum dedicated to another famous local, Balenciaga. In the late afternoon, your driver will drop you off at your luxurious hotel in beautiful San Sebastian. The night is yours to explore on your own. If you want something upscale tonight try the Mirador de Ulia with its sea views, and for something fun, you could go for tapas and pintxos in the old town. Being so close to France, it would be a crime not to visit and so today you will go sightseeing in the nearby French Pays Basque. From San Sebastian, drive northeast about 40 minutes to glamorous Biarritz. The morning is yours to explore this 19th-century playground for Europe’s aristocrats and celebrities. Check out the Chocolate museum, the lighthouse and its views over the sea, the aquarium and the gourmet Halles market. Pick up some French goodies at “Les Ateliers du Chocolat de Bayonne” and “Mille et un Fromage”. Lunch today is a very special affair, then in gorgeous St Jean de Luz at a smashing venue overlooking the sea, serving refined French cuisine. After lunch explore the captivating village with its fabulous boutiques, port, and beach. We suggest you enjoy a coffee or digestif in the Place Saint Louis. Return to San Sebastian in the early evening and the night is yours at leisure. You are spoiled for choice for restaurants in San Sebastian with top references including Akelarre, Kokotxa, and Zuberoa. Spend the morning on your own in San Sebastian. From your hotel, take a left towards the sea and follow the coast walk around to the pleasure port. There are great views of the sea from this walk. Depending on the month you visit, the waves are huge here and might splash over the 20-foot breaker, quite fun actually! You could visit the aquarium, have an aperitif and some tapas in the fascinating old town (called the “Parte Vieja”), and take a stroll along the refined Concha beach (lined with Belle Époque hotels and apartments). Around 1 PM you will meet your driver who will take you up to Mount Igueldo to admire the views over San Sebastian, don’t forget the camera! Your next stop is lunch at the fabulous Etxebarri restaurant, located in a beautiful farmhouse in the Basque hills in the two horse hamlet of Axpe. This unassuming looking restaurant and friendly chef have come on the radar for globetrotting foodies and you are likely to run into other diners from Paris to New York here. 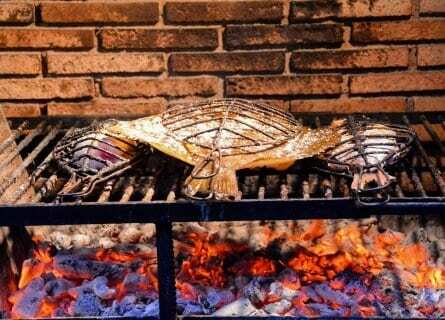 The Michelin starred chef Bitor Arguinzoniz is Spain’s “master griller” and you will taste a number of vegetable, seafood and meat dishes grilled to absolute perfection. The chef will create the tasting menu for you on the spot, based on the foods you like and you will have some wonderful wines arranged for you from appellations that might include Valdeorras, Rias Baixas, Bierzo, Priorat…. This is a fantastic place to have your last meal on this gourmet tour! After lunch, you will drive to Bilbao, where you will stay your last night before the flight home tomorrow. 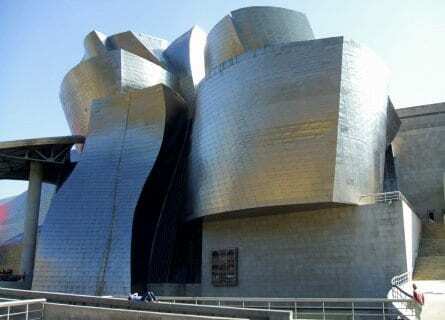 The late afternoon is yours to visit the Frank Gehry designed Guggenheim museum and the old town. Check into your hotel just across the street from the Guggenheim and settle in. This morning at your preferred time (depending on your flight) your elegant driver will take you to the airport. And this concludes your food and wine tour of Northern Spain. We hope you had an amazing time and we look forward to seeing you again on another tour! Your selection of wine companies and specific bodegas were perfect. We received a wonderful variety of types of wine and visited several sized companies. Our favorite happened to be Mr. Merino’s small bodega and his wine. It was wonderful how the selection of villages we visited met the same variable criteria as the bodegas. And the same can go for the restaurants. But, we both must say that our favorite time “eating” was our night out in San Sebastian with Andres “bar hopping” and tasting the many kinds of pinchos. We also bought on our own several of the special ingredients needed for good Spanish cooking and plan to try to make several of the dishes we ate. It will be interesting to see if we can at least partially duplicate them.